It’s a nutrient, it’s a deicer, it’s polluting our environment. Yet, I awoke to flurries in Cambridge, Massachusetts just a few days ago. These flurries turned into full-fledged snowfall by the time I got to work. Really? It was April 2nd. The good thing was that hopefully the city did not see the need to salt the roads heavily because it was going to be warm enough to prevent ice patches from forming. Of course, salting roads is beneficial because it prevents the formation of ice patches on roads and sidewalks, thus, making it safer for commuting motorists, cyclists, and pedestrians. However, excess salt can take a toll on the environment, and application of salt on the roads and sidewalks is not always done with the health of our surrounding ecosystems in mind. In some cases, salt is dumped unevenly or in patches which may end up sitting in the road for weeks. But just like when we add salt to pasta water and watch it disappear as it dissolves, road salt dissolves into rain or melting snow and flows with this water into nearby streams and lakes. How much salty are our waters, really? A recent study titled Salting our Freshwater Lakes, investigated how the practice of road salting is contributing to high salt levels in urban lakes. The study focused on the Midwest and Northeast regions of the United States, where there are dense road networks near freshwater lakes. Since paved surfaces comprise more than 1% of the area close to the shores of nearly one third of the lakes in the United States, road salting can have serious impacts on water quality. Salt, whether it is the kind you use for your pasta or to de-ice the road, contains chloride. In this study, the authors investigated the chloride concentrations in 284 freshwater lakes in North America that had at least 1% of paved surface nearby.A staggering 70% of the lakes investigated had elevated concentrations of chloride, likely due to road salting.Extrapolated to include all lakes in the study region (CT, MA, ME, MI, MN, NH, NY, RI, VT, and WI), this could include as many as ∼7,770 lakes! A staggering 70% of the lakes investigated had elevated concentrations of chloride, likely due to road salting. Unfortunately, the increase in salt level can have various negative impacts on amphibians and aquatic organisms living in or near ponds and streams that receive high salt loads. For example, amphibian egg masses can have reduced rates of survival in high salinity environments. High salt concentrations can also impact the lakes’ overall ecological functions and economic value. To prevent lakes from receiving such high salt loads, some cities and towns are developing plans to reduce their salt loads during winter. 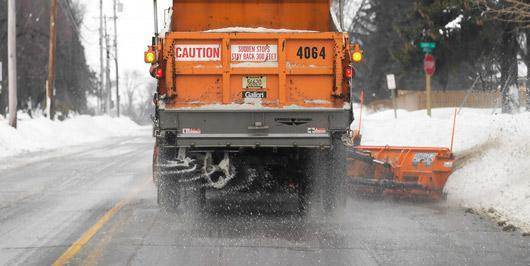 While many towns suspend street sweeping in winter, the town of Lakewood, CO actually sweeps streets as soon as possible after snow storms to help control air and water pollution. This way salt is removed from roads before it has a chance to run off into the surrounding water bodies. In conjunction with salt, sand may be added to the de-icing mixture. Over time, the sand can get crushed up into finer particles by vehicles which can then get whirled into the air resulting in higher particulate matter concentrations in the air. An organization based in Madison, WI takes a different approach and offers Winter Salt Certification programs that train professionals on how to best apply salt in winter. This is supported by WI Salt Wise, a partnership that also offers a web-based calculator on how much salt to apply, depending on temperature and salt type. Another solution recently made headlines in Canada, where the town mixed sugar beet juice and rock salt to de-ice roads. This mixture sticks to the road surface better than traditional rock salt, meaning there is less runoff. Since the mixture sticks to the road surface better, municipalities do not have to use as much salt in the first place. Cowansville, a town in Quebec, estimates it can reduce its salt use by 30%! But wait, there is more! The freezing temperature of the sugar beet juice-salt mixture is lower than that of traditional salt, making it even better for cold climates like Canada. For example, in Toronto the beet juice mixture is not even used until it hits -20 °C (-4 °F), at which point rock salt does not act as a deicer anymore because it is too cold. Cowansville, a town in Quebec, estimates it can reduce its salt use by 30%! But wait, there is more! The freezing temperature of the sugar beet juice-salt mixture is lower than that of traditional salt, making it even better for cold climates like Canada. Efforts like this are important components in our land management strategies. While salting or sanding the roads are important steps in protecting commuters (whether on foot for by bike or car), the best management strategy should balance public safety and environmental impacts. If we want to protect our streams and lakes from becoming too salty to support vulnerable organisms and valuable resources, more cities and towns in the United States should follow the examples set by Canadian towns or the towns of Lakewood or Madison, WI. Dugan HA, Bartlett SL, Burke SM, Doubek JP, Krivak-Tetley FE, Skaff NK, Summers JC, Farrell KJ, McCullough IM, Morales-Williams AM, Roberts DC. Salting our freshwater lakes. Proceedings of the National Academy of Sciences. 2017 Apr 25;114(17):4453-8. Hintz WD, Relyea RA. Impacts of road deicing salts on the early-life growth and development of a stream salmonid: Salt type matters. Environmental pollution. 2017 Apr 1;223:409-15. Karraker NE, Gibbs JP, Vonesh JR. Impacts of road deicing salt on the demography of vernal pool‐breeding amphibians. Ecological Applications. 2008 Apr 1;18(3):724-34. Consulting Firms: To Green or not to green? Beefore It’s Too Late: A Study of Diminishing Bee Populations and Why We Must Act Now! Great article! Growing up in MN, I’ve often been concerned/curious about all the salt going into our soils and waterways. The beet juice option is intriguing! Some are environmentally friendly, some are designed to be safe for children, some have been approved as pet-friendly, and some that do all three.